This entry was posted on April 21, 2014 at 10:35 am and is filed under 1980s, Concerts, Music, Rock, Uncategorized with tags Another Ticket, ballads, Blues, Classic Rock, Eric Clapton, hard rock, Just One N ight, The 1980s. You can follow any responses to this entry through the RSS 2.0 feed. You can leave a response, or trackback from your own site. I honestly don’t think I have ever seen this one before. I only know about it because local radio used to play “I Can’t Stand It” a lot. It is a good album though. 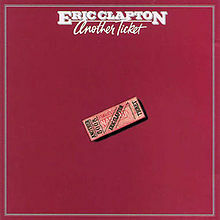 A buddy of mine in high school got into Clapton big back in the early 80s and so I remember this one. Never bought it but he played this album as much as I played Back In Black. Thanks for the flashback and it wasn’t t even medically induced so to speak! Glad to oblige, lol. This album and Back in Black, that’s a very interesting combination.